The Moon is New in Leo on July 23, 2017, at 5:45 AM EDT. On Sunday morning, the New Moon occurs early in the sign of Leo. The New Moon in Leo is an excellent time for formulating goals regarding “all things Leo.” We might concentrate on new ways to enhance our romantic life, creative endeavors and hobbies, and relationship with children, as well as to build our self-confidence and healthy pride in ourselves. Some of Leo’s “lessons” involve taking pride in ourselves as unique individuals, assuming responsibility for our lives, and giving ourselves warmly and generously to others. This New Moon period is an excellent time to meditate upon some of the characteristics of Leo. Keywords for this self-expressive fire sign — such things as proud, magnanimous, generous, hospitable, caring, warm, authoritative, active, and open — are traits that might be incorporated into our personalities. We all have Leo somewhere in our charts. Seek this month (and next) to improve those areas of life. It’s time to awaken the “inner child” in ourselves and to find ways to creatively express ourselves. With this potent Leo energy, we have the chance to make significant changes in our lives that will benefit us well beyond this Moon cycle. It’s time to make some plans and to set the stage for reaping the rewards from our new beginnings, as little or big as they may be, in approximately two weeks’ time after the Full Moon occurs. Next month, a New Moon will occur again in the sign of Leo, this time late in the sign, and will be a Solar Eclipse and particularly potent. With the New Moon occurring at the very beginning of the sign of Leo, new beginnings are emphasized. Events occurring now and next month may relate to January and February 2015. 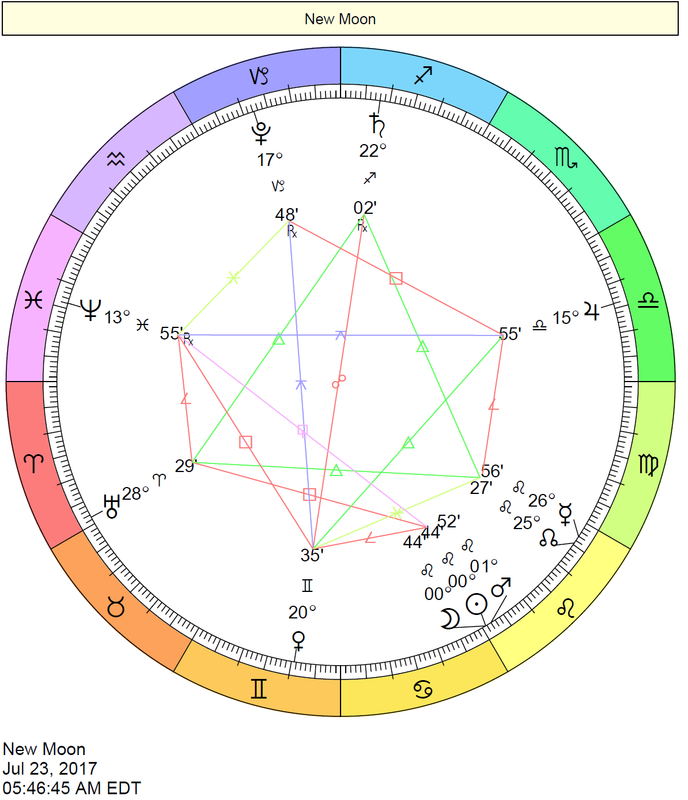 Where does the New Moon fall by house in your natal chart? Read more here.